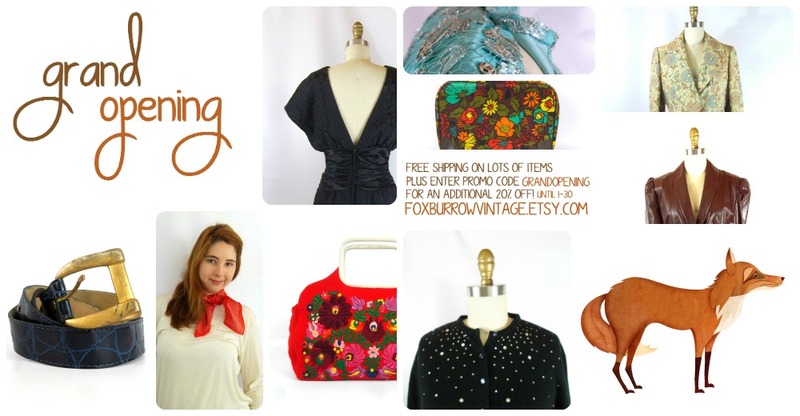 Today is the GRAND OPENING of Foxburrow Vintage! Getting a shop ready for opening is quite a task! There's over 70 new goodies available in the shop, so get ready to find something fun. From now on, it's all about adding new collections, outfits, and themes! Stay tuned for some really fun listings. I plan to add listings at least 2-3 times a week. Stay in touch with me via the blog or facebook. Or sign up for the e-mail newsletter here. Ok, now head on over to the SHOP! Make sure to use the promo code GRANDOPENING in the shop for an additional 20% off. Plus there's free US shipping on lots of goodies!